These signs, ("strings," "musical notes"), or, in the older expression, ("adornments," "tropes"), have been discussed, from the grammatical point of view, in Accents. 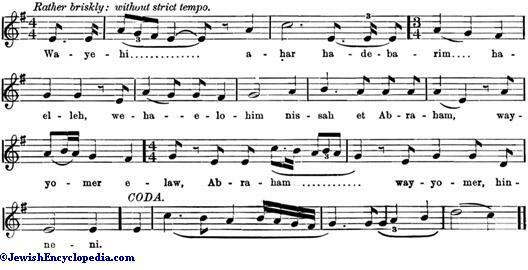 The musical system to which they now serve as a notation, apart from their syntactical force, must have existed long before the need was felt for such a notation, even as Vocalization was in use long before the vowel-signs were invented. 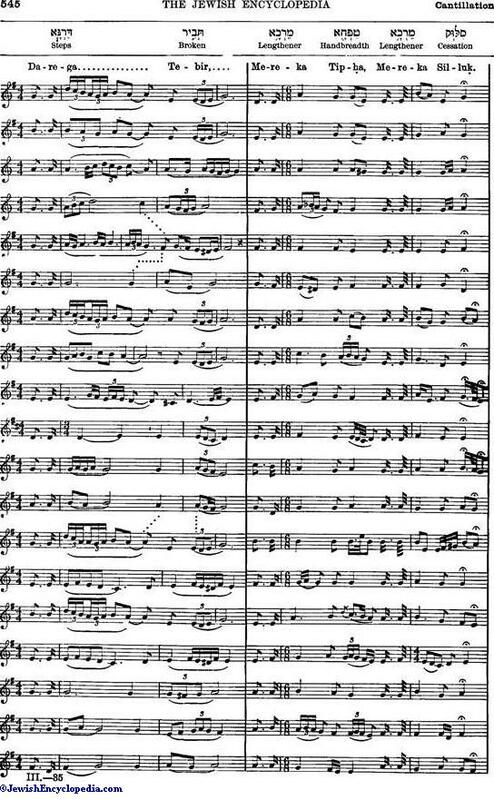 The notation which fixed the traditional pronunciation of each word may well, as Wickes points out, have been introduced at the same period and for the same reasons as the notation which fixed the traditional modulation. And, similarly, the causes which have led to a geographical variation of the original sounds in the one case have brought it about in the other. The earliest reference to the definite modulation of the Scripture occurs in the Babylonian Talmud (Meg. 32a), where R. Johanan deprecates the indifference of such as "read [the text] without tunefulness and repeat [the Mishnah] without song." 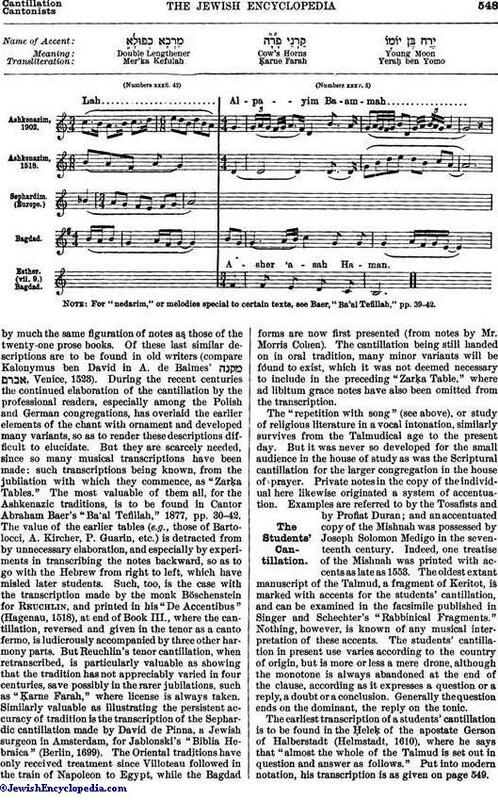 The use of the term ("tunefulness") shows that a melody definite enough to cause a pleasant impression was already attached to the Scriptural reading, and that it had long passed the stage of a syllabic plain-song which could only bring out the rhythm of the cursus as one group of syllables succeeded another. 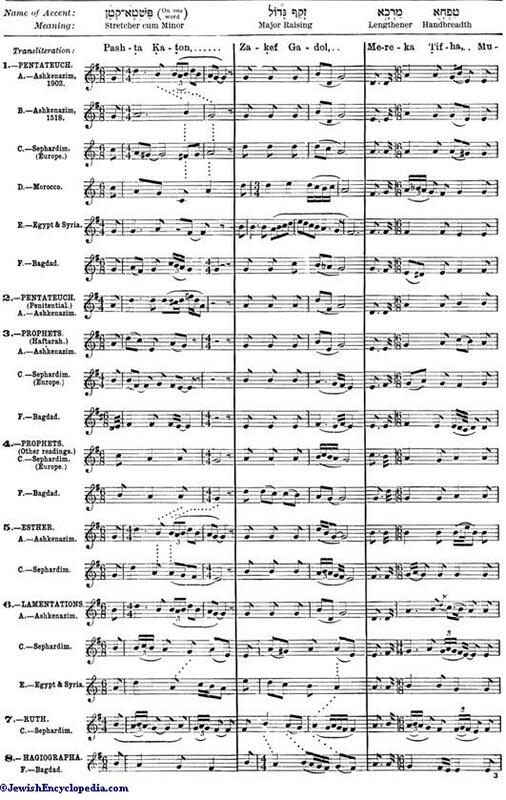 The cantillation must already have become "melismatic," with groups of notes, that is, attached to the more important syllables, so that the meaning of the text as well as its rhythm received emphasis and illustration from the chant. If the cantillation was already tuneful to contemporary ears, the way had been cleared for its hermeneutic application to the text. 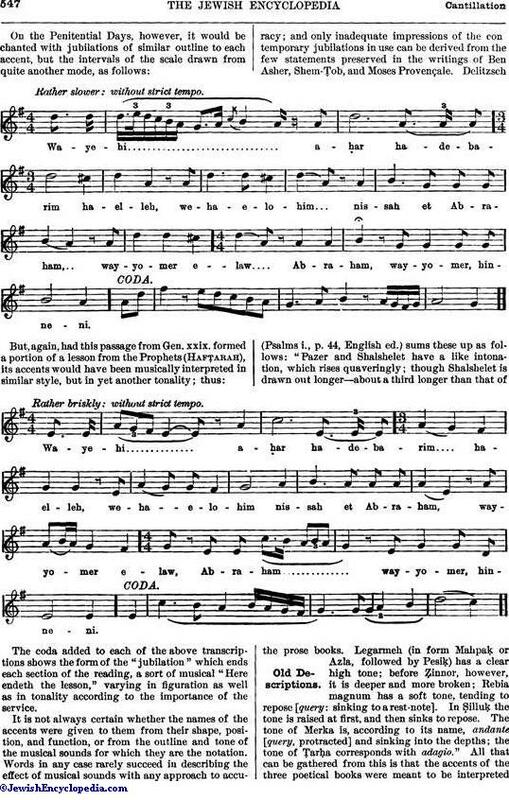 The vocal phrases which constituted its melodious element would, by their distinctness from the monotone recitation which joined them into tuneful succession, serve to bring out the logical and syntactical importance of the syllables sung to them from among the othersyllables comparatively slurred over on one note. 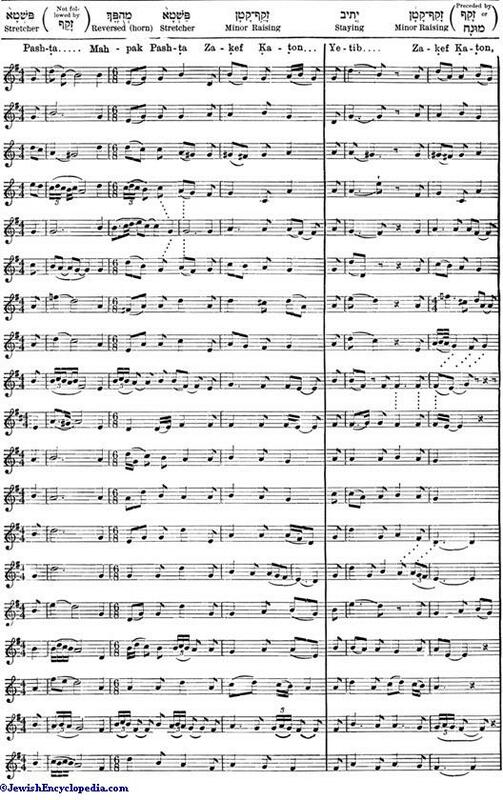 "In this way the music was made to mark not only the broad lines, but the finest shades of distinction in the sense; and when its signs were introduced into the text, they were also the signs of interpunction; no others were needed" (Wickes). For a long time no such signs, however, were necessary: the cantillation was transmitted orally, and teachers were recognized whose profession it was to give instruction in "the pausal system of the accentuation" (Ned. 37a). But precisely as in the case of the plain-song of the churches, memoriœ technicœ were gradually introduced in the private scrolls of individual masters, probably at a very early date—later crystallizing into the Babylonian and Palestinian systems of Accents. Before this necessity for a notation was generally felt, a system of manual signs had been developed (Ber. 62a), just as in the Greek Church, where it was called the χειρονομία ("Manuum variis motibus altitudinem, depressionem, flexus vocis significabant"); and the system survived into the Middle Ages, being referred to by Ben Asher ( , ed. Baer and Strack, 18), and later by Rashi (on Ber. 62a), while Pethahiah of Regensburg found them still practised in the Bagdad synagogues in the twelfth century. In modern times it has been noticed by Joseph Saphir in Yemen (Eben "Safir," i. 56b) and by Burkhardt in Tiberias. 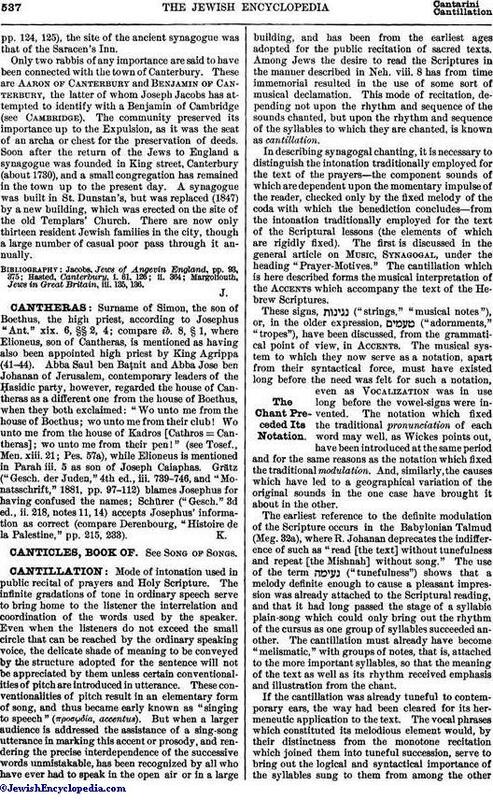 The Hebrew Bible is now pointed with two systems of accents. Of the system employed in the three poetical books, , Job, Proverbs, Psalms, the vocal interpretation has been forgotten, although traces of it appear to have been still retained in the fourteenth century (compare Simon ben Ẓemaḥ Duran, , 52b). 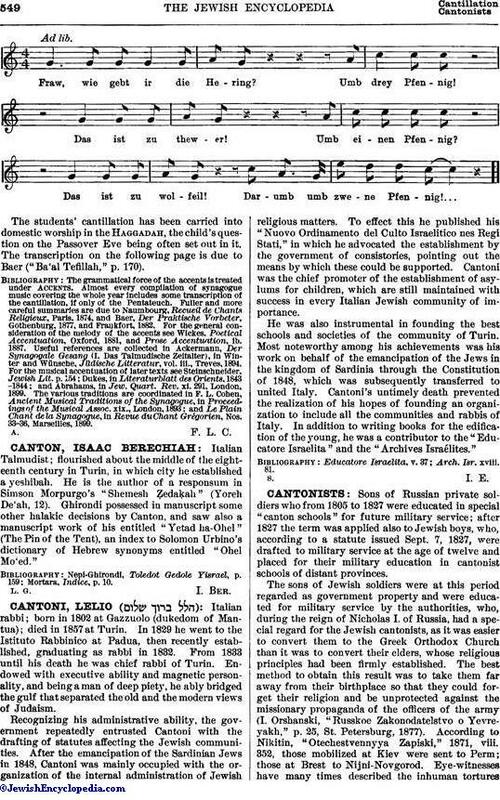 This loss is probably due to the early discovery that for congregational use—the chief employment of the Psalms, at least—the utilization would be at once more simple and more effective of a chant identical in each successive verse, and with enough melodic definiteness and individuality to be easily remembered, in comparison with a pointed cantillation varied from verse to verse, and demanding continuous attention from the readers. The similar measurement and dichotomy of verses in these poetical books would sometimes, indeed, suggest such a fixed melody by the similar accentuation of successive verses. But the prose Scriptures are recited by an individual, and for them the commoner species of pointing is employed. 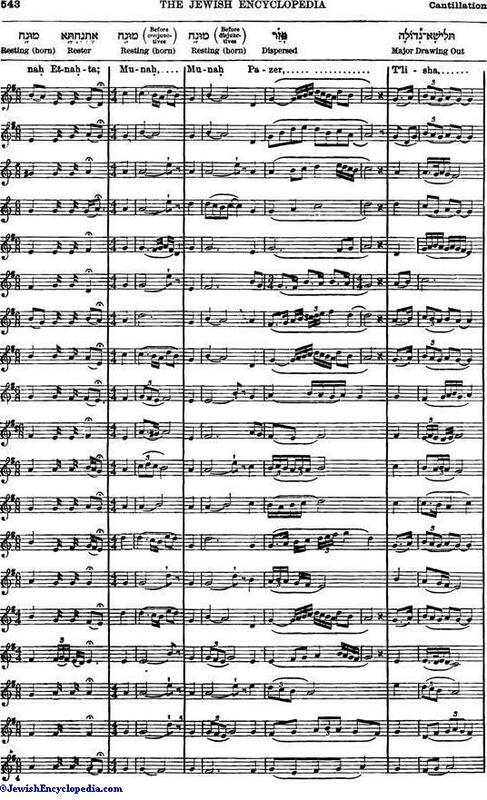 For this accentuation of the "twenty-one books" the cantillation vigorously survives in a certain number of antique forms, divergent in detail of tune and especially in tonality (or scale structure), but parallel in character and in outline. 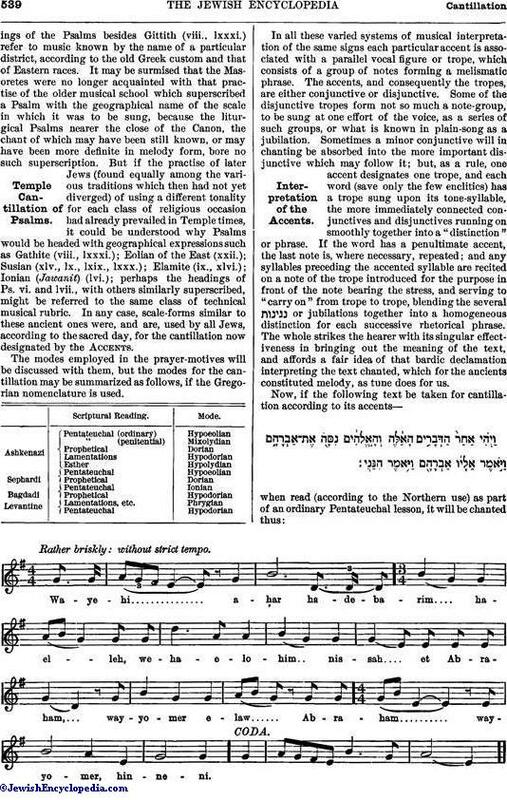 This parallelism of divergent forms results in several divergent musical interpretations being given to the accents in each Minhag or rite traditional among Jews since the Middle Ages (remarked before 1444 in S. Duran's , 52b). This feature is probably of great antiquity, and may have already existed in the Talmudical age. 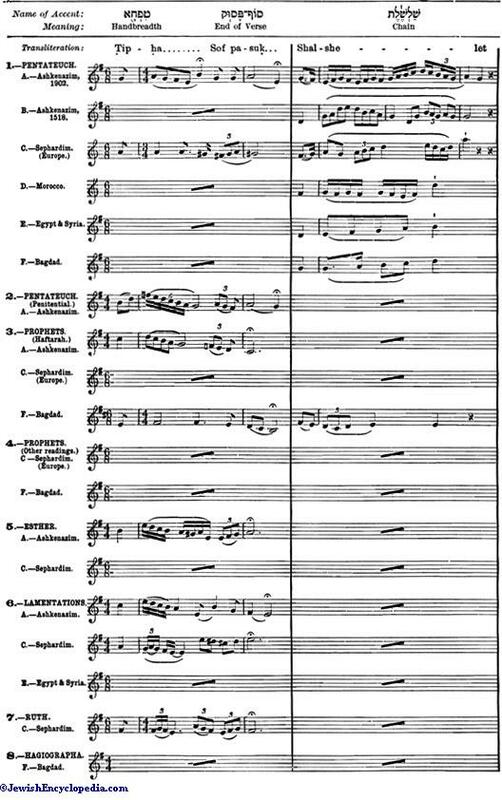 A similar parallelism is noticeable among the various prayer-motives (or outlines of melody for intoning the devotional portions of the various services; see Music, Synagogal) in each rite, and exhibits the same uniformity of employment of different tonalities. 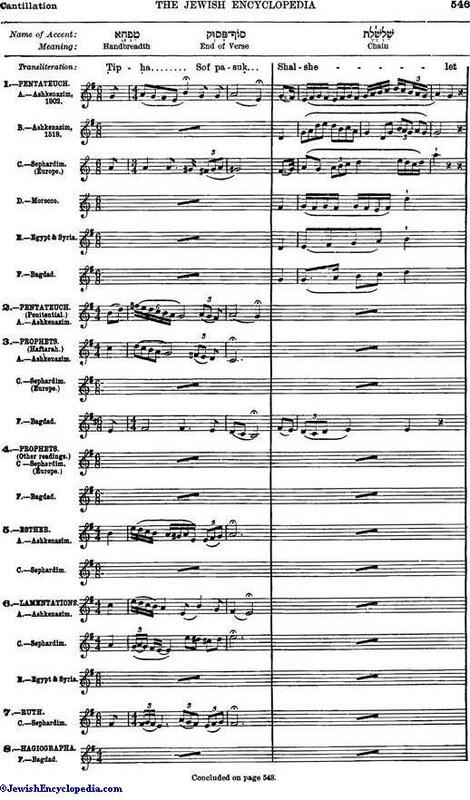 The principle seems to be general in Jewish worship-music, and may be formulated as the specific allotment in tradition of a particular mode or scale-form to each sacred occasion, on account of some esthetic appropriateness felt to lie in the association. While the only two modes utilized in modern European music, the major and the minor, are to be met with, they are of insignificance in face of the rich variety of modes of an antique or Oriental character more frequently favored in all the musical rituals which have not recently broken with tradition. 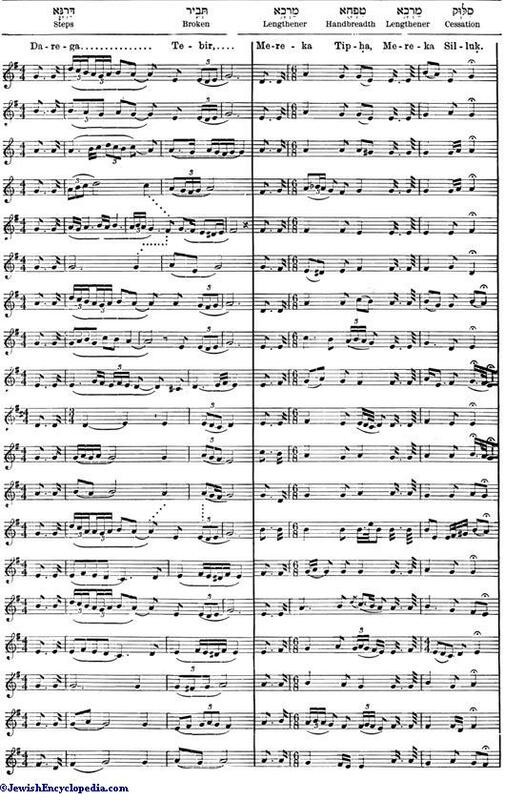 The cantillation adheres only to modes similar to those of the Catholic plain-song, probably from a contemporary development at the close of the Dark Ages. The resemblance of some tropes to intonations employed in reading the Koran is at once striking; and the tonalities preserved among the Jews closely resemble those of the Byzantine and Armenian traditions, of the folk-song of eastern Europe, and of Perso-Arab melody. 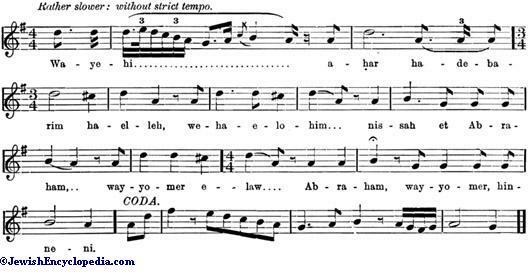 This modal feeling of Jewish worship-music is still reminiscent of the musical theory and practise of eastern Asia, which radiated from Babylon to the Mediterranean and to the Indian ocean. 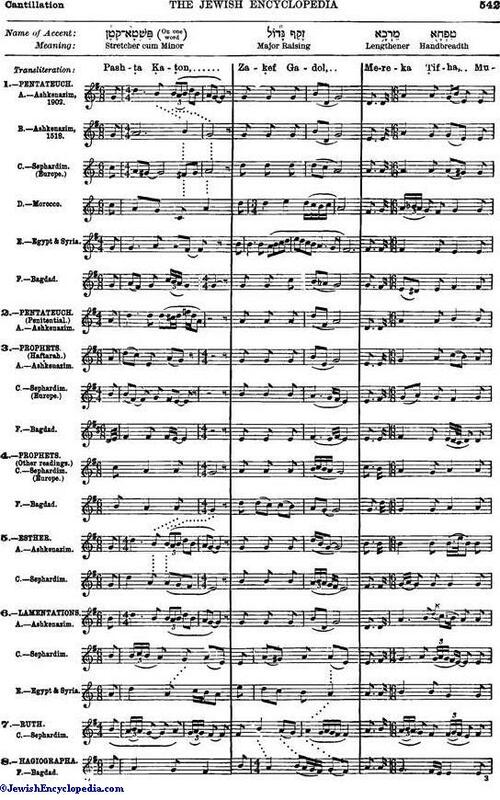 In all these varied systems of musical interpretation of the same signs each particular accent is associated with a parallel vocal figure or trope, which consists of a group of notes forming a melismatic phrase. The accents, and consequently the tropes, are either conjunctive or disjunctive. Some of the disjunctive tropes form not so much a note-group, to be sung at one effort of the voice, as a series of such groups, or what is known in plain-song as a jubilation. Sometimes a minor conjunctive will in chanting be absorbed into the more important disjunctive which may follow it; but, as a rule, one accent designates one trope, and each word (save only the few enclitics) has a trope sung upon its tone-syllable, the more immediately connected conjunctives and disjunctives running on smoothly together into a "distinction" or phrase. 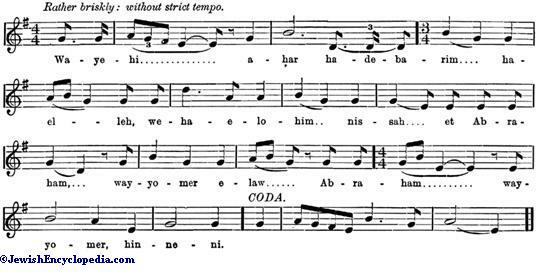 If the word has a penultimate accent, the last note is, where necessary, repeated; and any syllables preceding the accented syllable are recited on a note of the trope introduced for the purpose in front of the note bearing the stress, and serving to "carry on" from trope to trope, blending the several or jubilations together into a homogeneous distinction for each successive rhetorical phrase. The whole strikes the hearer with its singular effectiveness in bringing out the meaning of the text, and affords a fair idea of that bardic declamation interpreting the text chanted, which for the ancients constituted melody, as tune does for us. 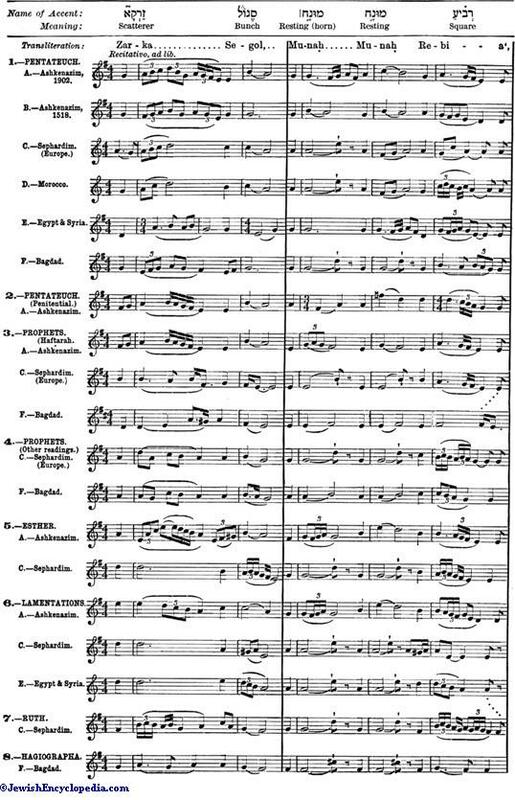 It is not always certain whether the names of the accents were given to them from their shape, position, and function, or from the outline and tone of the musical sounds for which they are the notation. 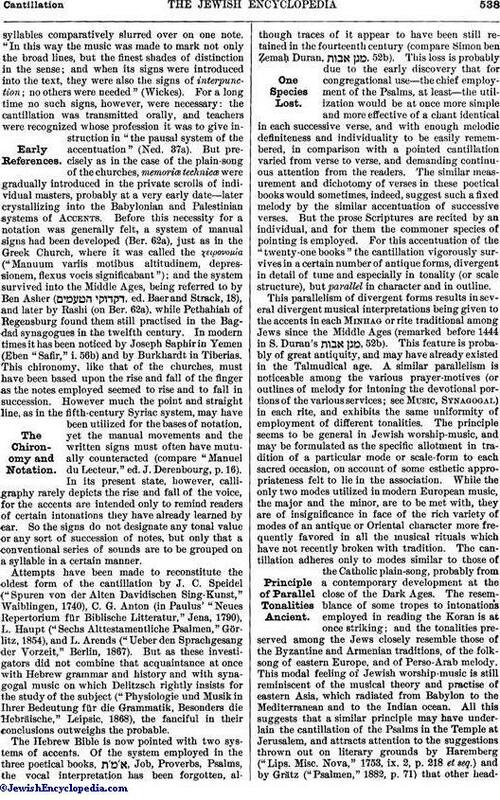 Words in any case rarely succeed in describing the effect of musical sounds with any approach to accuracy; and only inadequate impressions of the con temporary jubilations in use can be derived from the few statements preserved in the writings of Ben Asher, Shem-Ṭob, and Moses Provençale. Delitzsch (Psalms i., p. 44, English ed.) sums these up as follows: "Pazer and Shalshelet have a like intonation, which rises quaveringly; though Shalshelet is drawn out longer—about a third longer than that of the prose books. Legarmeh (in form Mahpaḳ or Azla, followed by Pesiḳ) has a clear high tone; before Ẓinnor, however, it is deeper and more broken; Rebia magnum has a soft tone, tending to repose [query: sinking to a rest-note]. In Ṣilluḳ the tone is raised at first, and then sinks to repose. 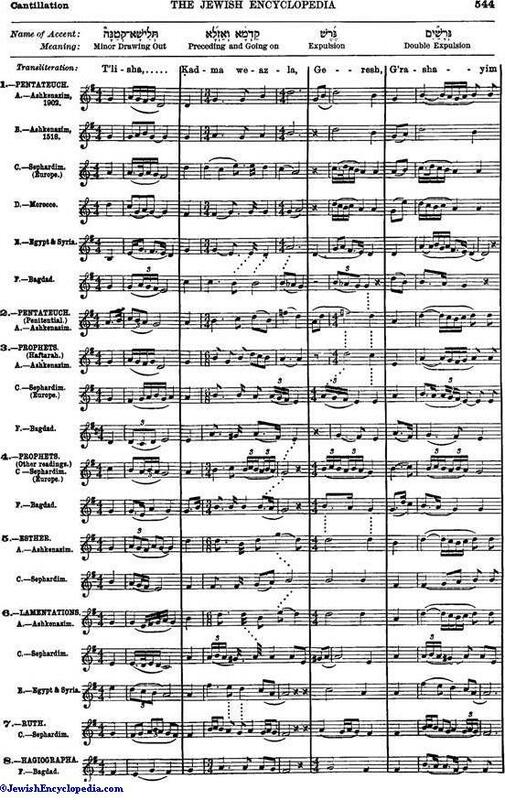 The tone of Merka is, according to its name, andante [query, protracted] and sinking into the depths; the tone of Ṭarḥa corresponds with adagio." All that can be gathered from this is that the accents of the three poetical books were meant to be interpretedby much the same figuration of notes as those of the twenty-one prose books. Of these last similar descriptions are to be found in old writers (compare Kalonymus ben David in A. de Balmes' , Venice, 1523). 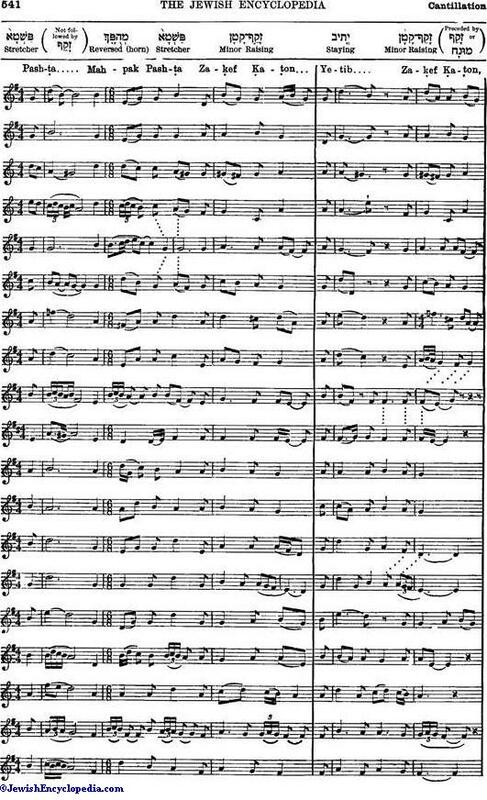 During the recent centuries the continued elaboration of the cantillation by the professional readers, especially among the Polish and German congregations, has overlaid the earlier elements of the chant with ornament and developed many variants, so as to render these descriptions difficult to elucidate. But they are scarcely needed, since so many musical transcriptions have been made; such transcriptions being known, from the jubilation with which they commence, as "Zarḳa Tables." 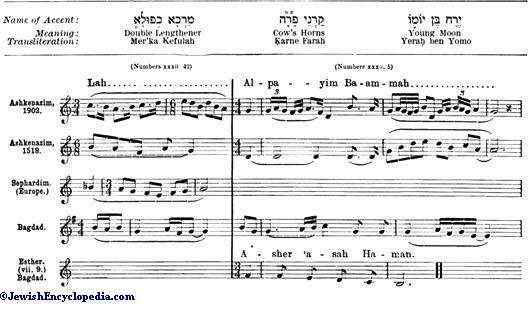 The most valuable of them all, for the Ashkenazic traditions, is to be found in Cantor Abraham Baer's "Ba'al Tefillah," 1877, pp. 30-42. The value of the earlier tables (e.g., those of Bartolocci, A. Kircher, P. Guarin, etc.) is detracted from by unnecessary elaboration, and especially by experiments in transcribing the notes backward, so as to go with the Hebrew from right to left, which have misled later students. 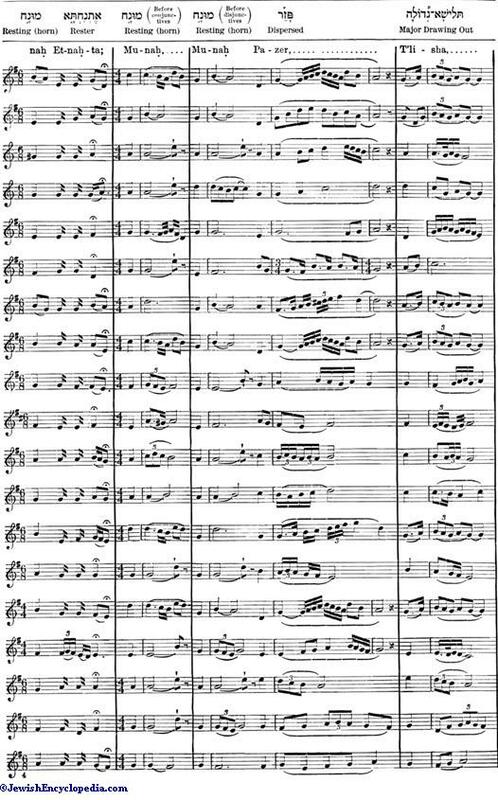 Such, too, is the case with the transcription made by the monk Böschenstein for Reuchlin, and printed in his "De Accentibus" (Hagenau, 1518), at end of Book III., where the cantillation, reversed and given in the tenor as a canto fermo, is ludicrously accompanied by three other harmony parts. 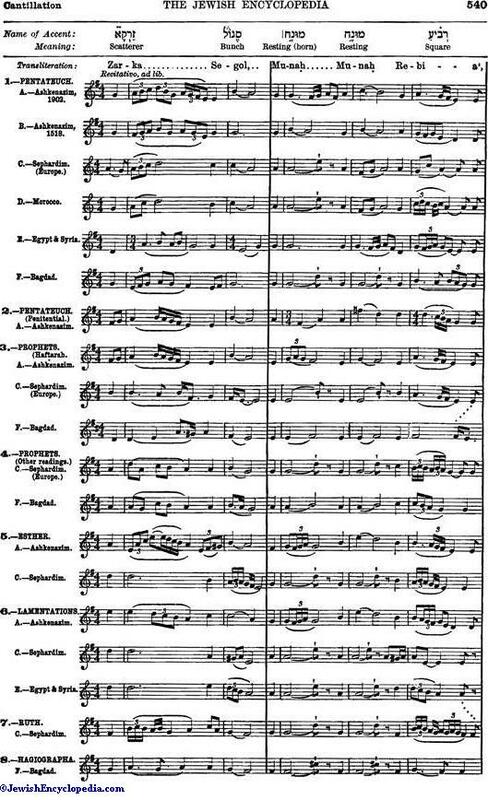 But Reuchlin's tenor cantillation, when retranscribed, is particularly valuable as showing that the tradition has not appreciably varied in four centuries, save possibly in the rarer jubilations, such as "Ḳarne Farah," where license is always taken. Similarly valuable as illustrating the persistent accuracy of tradition is the transcription of the Sephardic cantillation made by David de Pinna, a Jewish surgeon in Amsterdam, for Jablonski's "Biblia Hebraica" (Berlin, 1699). 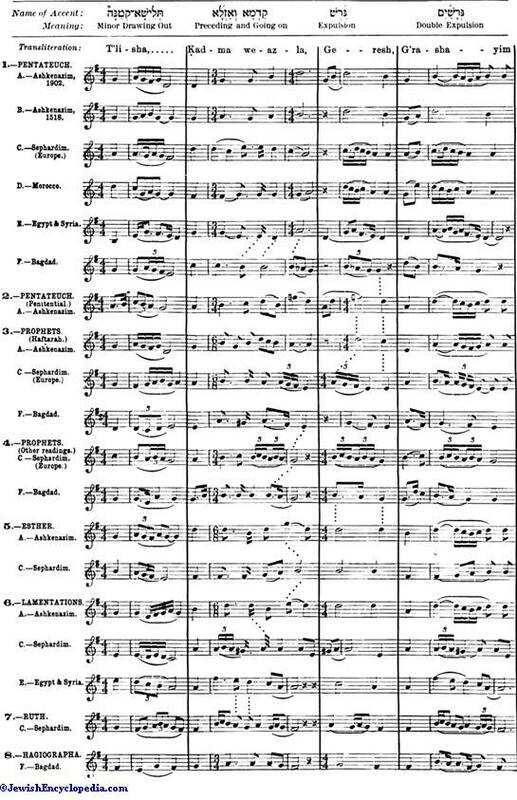 The Oriental traditions have only received treatment since Villoteau followed in the train of Napoleon to Egypt, while the Bagdad forms are now first presented (from notes by Mr. Morris Cohen). The cantillation being still handed on in oral tradition, many minor variants will be found to exist, which it was not deemed necessary to include in the preceding "Zarḳa Table," where ad libitum grace notes have also been omitted from the transcription.